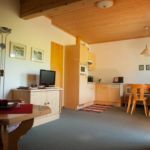 Our comfortable country house is situated in the quiet, southern outskirts of the town of Gröbming. The climatic spa of Gröbming is surrounded by mountains and is situated in the wide open Enns valley in the middle of the well-known Schladming/Dachstein-Tauern sport region. Reserve your accommodation and Landhaus Amadeus Gröbming will directly send the confirmation in 1 workday. The rating of Landhaus Amadeus Gröbming is 9.9 from the maximum 10, 3 based on actual and valid guest ratings and reviews.